Embrace your inner eight-year-old and relive your prettiest Polly Pocket daydreams with this utterly adorable eyeshadow palette. Wrapped up in bright retro packaging, each palette features five ‘supershadows’ – combining candy-bright and almost neutral shades, each colour collection is carefully crafted with high-end pigments that deliver maximum payoff and smooth-as-butter performance (and they're beautiful on cheeks as well as eyes). 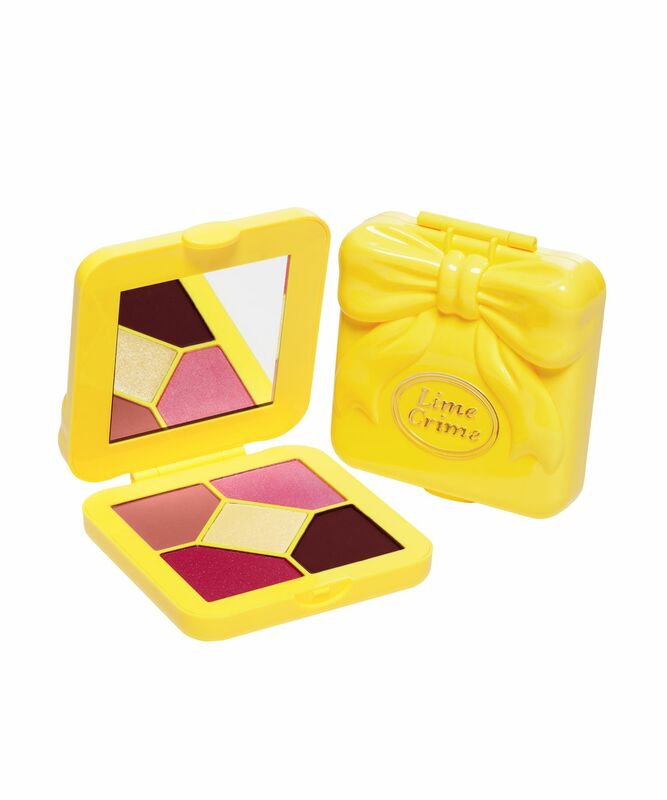 Criminally cute and ultra-kitsch, Lime Crime’s Pocket Candy Palette is the most adorable way to embrace some 90s nostalgia – and achieve exquisite eye and cheek looks. 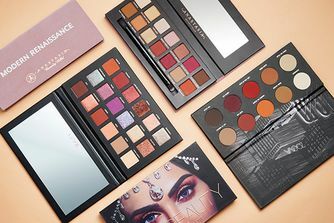 Housed in irresistible Polly Pocket-style packaging, each palette features five complementary colours; from eye-enhancing brights to almost neutrals and cheek-brightening pinks, every shade is carefully crafted from high-end pigments that deliver maximum payoff and buttery soft performance. There are three candy-bright colour options: ‘Sugar Plum’ features shimmering pinks, deep mauve and iridescent purple shades; ‘Bubblegum’ unites shimmering champagne, cotton candy pink, peach, purple and electric blue with matte brown-beige; ‘Pink Lemonade’ spans from velvety matte burgundy and dusky rose to shimmering pink, strawberry pink-red and yellow gold. If you’re struggling to choose between them, collect them all for the cutest trio in the make up playground. Apply shade(s) with brush or fingers for bright-eyed, 90s chic. CANDIED PLUM: Mica,Ethylhexyl Palmitate,Zinc Stearate,Synthetic Fluorphlogopite,Phenoxyethanol,Caprylyl Glycol,Ethylhexylglycerin,Hexylene Glycol. May Contain [+/-]: Titanium Dioxide (CI 77891),Iron Oxides (CI 77491,CI 77499),Red 7 Lake (CI 15850). FAIRY FLOSS: Mica,Calcium Sodium Borosilicate,Aluminum Calcium Sodium Silicate,Ethylhexyl Palmitate,Synthetic Fluorphlogopite,Zinc Stearate,Silica,Phenoxyethanol,Caprylyl Glycol,Ethyhexylglycerin,Hexylene Glycol. May Contain [+/-]: Titanium Dioxide (CI 77891),Tin Oxide,Red 7 Lake (CI 15850),Ferric Ferrocyanide (CI77510). ICING: Alumina,Mica,Ethylhexyl Palmitate,Synthetic Fluorphlogopite,Zinc Stearate,Phenoxyethanol,Caprylyl Glycol,Ethylhexylglycerin,Hexylene Glycol. May Contain [+/-]: Titanium Dioxide (CI 77891),Tin Oxide. NUT CRACKER: Mica,Ethylhexyl Palmitate,Silica,Zinc Stearate,Synthetic Fluorphlogopite,Dimethicone,Phenoxyethanol,Caprylyl Glycol,Ethylhexylglycerin,Hexylene Glycol. May Contain [+/-]: Iron Oxides (CI 77491,CI 77499),Titanium Dioxide (CI 77891),Tin Oxide. SUGAR & SPICE: Mica,Ethylhexyl Palmitate,Zinc Stearate,Silica,Dimethicone,Phenoxyethanol,Caprylyl Glycol,Ethylhexylglycerin,Hexylene Glycol. May Contain [+/-]: Titanium Dioxide (CI 77891),Iron Oxides (CI 77491,CI 77499),Red 7 Lake (CI 15850). BLOW: Mica,Synthetic Fluorphlogopite,Ethylhexyl Palmitate,Zinc Stearate,Hydrogenated Polyisobutene,Phenoxyethanol,Caprylyl Glycol,Palmitic Acid,Ethylhexylglycerin,Hexylene Glycol,Benzoic Acid. May Contain [+/-]: Titanium Dioxide (CI 77891),Red 7 Lake (CI 15850),Tin Oxide,Ferric Ferrocyanide (CI 77510),Manganese Violet (CI 77742). BUBBLE: Alumina,Mica,Calcium Titanium Borosilicate,Ethylhexyl Palmitate,Zinc Stearate,Hydrogenated Polyisobutene,Phenoxyethanol,Caprylyl Glycol,Palmitic Acid,Ethylhexylglycerin,Hexylene Glycol,Benzoic Acid. May Contain [+/-]: Titanium Dioxide (CI 77891),Tin Oxide,Blue 1 Lake (CI 42090:2). CHEW: Mica,Ethylhexyl Palmitate,Silica,Zinc Stearate,Dimethicone,Phenoxyethanol,Caprylyl Glycol,Ethylhexylglycerin,Hexylene Glycol. May Contain [+/-]: Titanium Dioxide (CI 77891),Yellow 5 Lake (CI 19140),Iron Oxides (CI 77491,CI 77499). POP: Mica,Calcium Titanium Borosilicate,Ethylhexyl Palmitate,Zinc Stearate,Silica,Phenoxyethanol,Caprylyl Glycol,Ethylhexylglycerin,Hexylene Glycol. May Contain [+/-]: Titanium Dioxide (CI 77891),Bismuth Oxychloride (CI 77163),Red 7 Lake (CI 15850),Iron Oxide (CI77491),Tin Oxide. SNAP: Mica,Calcium Sodium Borosilicate,Ethylhexyl Palmitate,Silica,Zinc Stearate,Phenoxyethanol,Caprylyl Glycol,Ethylhexylglycerin,Hexylene Glycol. May Contain [+/-]: Titanium Dioxide (CI 77891),Bismuth Oxychloride (CI 77163),Tin Oxide,Red 7 Lake (CI 15850). BABY CAKE: Mica,Ethylhexyl Palmitate,Zinc Stearate,Phenoxyethanol,Caprylyl Glycol,Talc,Ethylhexylglycerin,Hexylene Glycol. May Contain [+/-]: Titanium Dioxide (CI 77891),Iron Oxides (CI 77491,CI 77492,CI 77499),Yellow 5 Lake (CI 19140). BROWN SUGAR: Mica,Silica,Ethylhexyl Palmitate,Zinc Stearate,Dimethicone,Phenoxyethanol,Caprylyl Glycol,Talc,Ethylhexylglycerin,Hexylene Glycol. May Contain [+/-]: Titanium Dioxide (CI 77891),Iron Oxides (CI 77491,CI 77492,CI 77499),Yellow 5 Lake (CI 19140),Red 6 (CI 15850),Red 7 Lake (CI 15850). LEMONADE: Mica,Calcium Titanium Borosilicate,Aluminum Calcium Sodium Silicate,Ethylhexyl Palmitate,Zinc Stearate,Silica,Phenoxyethanol,Hydrogenated Polyisobutene,Caprylyl Glycol,Ethylhexylglycerin,Hexylene Glycol,Palmitic Acid,Benzoic Acid. May Contain [+/-]: Titanium Dioxide (CI 77891),Tin Oxide,Yellow 5 Lake (CI 19140). PINK JELLY: Mica,Ethylhexyl Palmitate,Alumina,Zinc Stearate,Silica,Hydrogenated Polyisobutene,Phenoxyethanol,Caprylyl Glycol,Ethylhexylglycerin,Hexylene Glycol,Palmitic Acid. May Contain [+/-]: Titanium Dioxide (CI 77891),Red 7 Lake (CI 15850),Red 30 Lake (CI 73360),Iron Oxide (CI 77491),Tin Oxide. STRAWBERRY: Mica,Ethylhexyl Palmitate,Calcium Sodium Borosilicate,Zinc Stearate,Synthetic Fluorphlogopite,Silica,Phenoxyethanol,Caprylyl Glycol,Ethylhexylglycerin,Hexylene Glycol. May Contain [+/-]: Titanium Dioxide (CI 77891),Red 7 Lake (CI 15850),Red 6 (CI 15850),Tin Oxide. Despite all the bad reviews, love the colours and can't fault them really, with a small exception of the purple being slightly more difficult to apply. Not a good product at all. It has interesting matte shades, but horrible highlighters that transfer badly, the quality is very different from the Venus palettes and it smells terribly chemical. Expected more, not worth the money. The packaging for this product is gorgeous but sadly the quality is seriously lacking. Unless it’s just to look nice on your dresser, save yourself some cash and buy a palette from Revolution because the quality is better and the shadows last longer from their £4 palette than the colours in this one. After a few hours I barely had any shadow left on at all and that was with using a primer. Really disappointing! I got only Pink Lemonade and I love it! Mattes are soft and nice, shimmering shades are not so bright as photo shows (I don’t photo with swatches), but they are beautiful too! Yeah, it has a chemical scent, but only if you put your palette right near your nose. I didn’t have any allergic reactions through the day. Didn’t like it too much.. some colors are not as pigmented as I would like them to be, also the smell of the refills is kinda strange like old old eyeshadows or face powder. Honestly, used it once and don’t know if will do it again bus the pack is awesome so I’ll keep it for my collection of cute like palettes!